In the Feldenkrais Training Amsterdam from Larry Goldfarb, there is a tradition that all the students of the training start a community project in some area of life at the end of their second year of training. They give Feldenkrais lessons for free to for them unknown people. The meaning of this project is to give something in return to the community for the privilege to be part of the Feldenkrais Community. It’s a great project with many advances. The students learn to give lessons to unknown people, they overcome their fears of given Feldenkrais lessons, they promote the Feldenkrais Method, and if they are lucky they find people who are interested in getting more Feldenkrais lessons and pay for it. The people who get the lessons can experience the advance of a few Feldenkrais lessons. Monja Boonzaier, one of our students in the 4th International Child’Space Training Amsterdam, started a community project in a small town in Soweto, South Africa. Here she brings a report of her first meeting with the mothers and babies. I went on a Soweto tour in December last year with Ilan Ossendryver (www.toursoweto.com) a Jewish journalist and photographer and he took me to visit Kliptown one of the oldest districts in the South of Soweto and also one of the most underdeveloped areas unlike the rest of Soweto. The residents of the Kliptown Community do not have electricity, water, sanitation or means of transport, the children who go to school have to walk 1.5 hrs each way to get to school and back home. The tour with Ilan through Kliptown was a heartening experience which was more than just a sightseeing tour; Ilan Ossendryver introduced me to the Director of the Kliptown Youth Bob Nameng (www.sowetokliptownyouth.webs.com), the warm welcome of the community, being welcomed into their homes and especially the interaction with the children was an incredible experience. The moment we walked over the bridge into Kliptown I knew that I would like to offer my expertise of what I have learnt in Feldenkrais and what I am currently learning at Child’Space to the Kliptown community. To practice what I have learnt from the first segment of Child’Space and to share with young uneducated mothers and their babies how to engage with themselves and their little ones through movement, sound (singing) and touch. 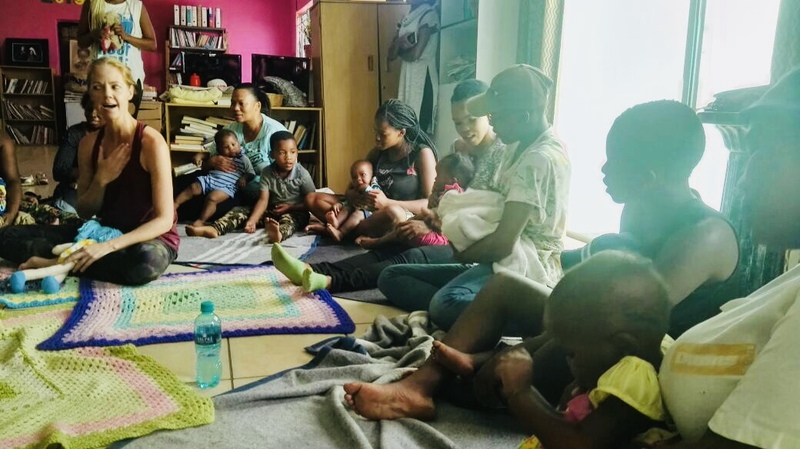 The initial plan was to have a group of 10 mothers and babies (ages between 1 and 6 months) as we have only learnt in the first segment of the training how to work with babies between 6 weeks and 5.5months. 12 mothers turned up with babies between the ages of 2 months and 1 years old! I had to improvise a lot as there was only 2 babies of 2 months and the rest were 6 months to one year old. I know it is not ideal to work with a group of babies where the ages are so different but I wanted to continue with the class and decided that I am going to be creative and see how things develop. Some babies were already tired by the time we started the class and the smaller ones who were sleeping woke up. 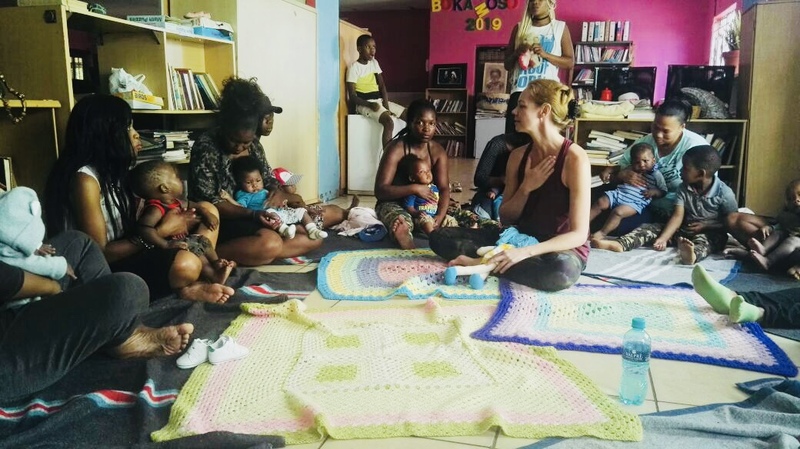 We started sitting in a circle, where I asked the mothers to please take off their baby’s shoes and I briefly introduce myself and that I am here to teach them about their baby’s bodies and how to connect with their baby through movement, sound and touch. I wanted to go around the circle to give each mother and baby a chance to introduce herself and her baby, saying their names and how old the baby is as well as say something about their baby. This did not quite work as some babies got restless and started crying. I asked everyone to stand up and form a circle and showed the mothers how to hold their baby with their back against their belly and to hold the legs from underneath, I demonstrated with my doll called blossom. I asked the mothers what Zulu or Sotho (the 2 main Bantu languages they speak in the group) song they sing to their babies and they said Thula Mama (A Lullaby song which means “hush little child”) . This happens to be one of my favourite songs too , I created a contemporary dance solo to this song when I was in my 2nd year of my degree program at London Contemporary Dance school. I showed the mothers how to start stomping their feet and explained that the stomping brings vibration and the baby can feel this vibration coming from the mother’s feet through to their little bodies. We created a circle and everyone was facing inwards and we started singing Thula Mama and the babies immediately started to settle. I then gave each mother a chance to enter the circle and to introduce herself and her baby. I noticed during the introduction how shy the mothers were, they did not make eye contact whilst introducing themselves and their baby. Only one mother said something about her baby, the others only said the name and the age of the baby. This clearly showed the lack of confidence in the mothers, something I would like to work on during the course of the project. After the introduction I asked them to sit back down on the floor with their babies and to let the baby sit/lean with their backs against them. One little boy started crying again and his mother started tapping him on his chest in quite a hard and fast way. I decided to introduce the tapping at this moment, I asked all the mothers to start tapping their baby on their chests but in a slower way with an open soft hand and I asked them to sing the song Thula Mama and tap to the beat of the song. I went over to the mother whose baby was crying and I showed her how to tap him more gently and when I made eye contact with him and brought my face close to his face whilst singing he straight away stopped crying. I looked around the circle and everyone was tapping nicely whilst singing, I thought this worked quite well. I then introduced the tapping on the legs, I showed the mothers to start tapping from the foot whilst singing and tap all the way up the leg on the inside and outside to the beat of the song. One baby started moving his ankle up and down so I let the baby take the lead and I showed the mothers to take the ankle and move it up and down whilst singing. We tapped both feet and then moved to the arms, by the time we finished tapping the arms two of the babies were fast asleep! Some of the babies started getting restless and crying so I asked everyone to stand up again in the circle and hold the babies like before. We started moving in a circle stomping the feet. We moved clockwise and anti -clock wise around the circle and I then had them make the circle smaller so the babies can come closer to each other to see one another, we kept singing and I played with the tone of voice singing softer and louder. I then used Orly’s idea from the day we worked with the babies in the training last year. Everyone was in the circle and she made the parents repeat after her; walking with the babies forward and say out loud forward, forward, forward and then walking backwards saying back, back, back. We did this a couple of times and then we turned around in a circle saying turning to the right, turning to the right and when we got to the middle saying middle, middle, middle, we repeated this to the left. We put the entire sequence of forward, back and turning together. Even the mothers whose babies were sleeping moved with us with their sleeping baby . I thought this was a good moment to end the class as the babies really got unsettled, I think it was most likely because they were hungry and tired. None of the mothers gave any of their babies anything to drink during the entire time (9.30-10.40am). I ended the class here. The organizer of the Community centre took the names of the mothers and the ages of their babies, for the next class we will try to organize two groups where I can work with one age group between 1 and 5 months and then another 6 months and one year. The next class will be in March.